Stock Low : 219 items left. Crafted from 100% cotton this adorable tee makes the perfect transseasonal piece. It features eye-catching glittery prints on front with soft marled fabrication that's sure to be on-trend all throughout the seasons. 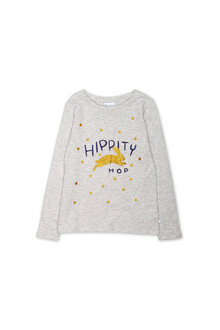 So hop to it and make a style statement!